On December 11, 2018, the U.S. Environmental Protection Agency’s Acting Administrator and the U.S. Army Corps of Engineers’ announced the release of their proposed replacement definition of “Waters of the U.S.” This proposed rule redefines the scope of waters and wetlands that fall under the federal Clean Water Act and thus receive protection. This new “dirty water rule” will remove protection for up to 60 percent of United States drinking water sources. Your comments opposing this proposed rule are crucial. You can comment until April 15th. Encourage your state and local officials to oppose this rule as well. Submit your public comment on the proposed rule by April 15th. More personalized comments have greater impact. Please revise our sample comment and then submit. I live on the Rappahannock River. 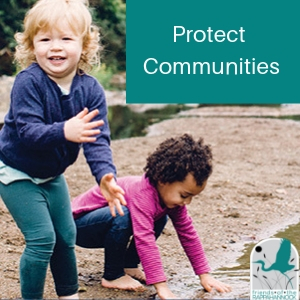 I'm concerned this proposed rule would remove protections that impact overall water quality. I rely on this as a source of my drinking water. All this could be harmed by the loss of federal protections. I ask the EPA to keep the Clean Water Act intact. The Clean Water Act, which has protected and maintained our nation’s clean waters for over 50 years, is now under threat. If the current administration’s proposal becomes law, then more than half of the stream miles in the United States will be at risk for pollution. Pollution dumping by various industries will contaminate bodies of water used Virginia’s local economies, communities, and families, affecting drinking water, recreation and overall quality way of life. In total, 200 million people living in the United States will have their drinking water sources negatively impacted. If this rule becomes law then it is estimated that up to 110 million acres of wetlands in the United States will be at risk for severe pollution and filling. 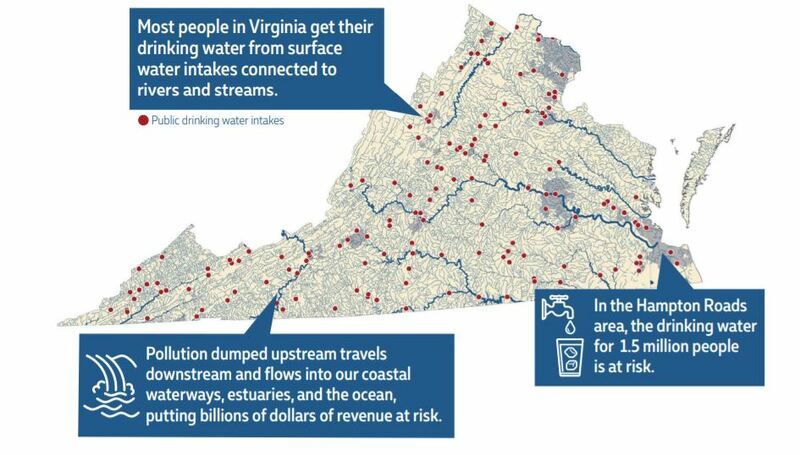 Three in every four Virginians, or 77 percent of Virginians will have their clean water drinking source threatened. More than 55,000 miles of Virginia’s streams will be at risk for pollution via industrial dumpers. This pollution will then spread and contaminate Virginia’s rivers, lakes and coastal waters as well. Hundreds of thousands of acres of wetlands in Virginia that provide flood protection, filter pollution, and provide essential wildlife habitat are at risk under the new Clean Water Replacement Rule. Virginia’s economy and vibrant recreational industry heavily rely on these wetlands. According to the EPA’s own estimates, their proposal will put at risk up to $572 million annually in benefits to Americans, including reducing flooding, filtering pollution, providing wildlife habitat, and supporting hunting and fishing. Over 7,000 miles of the Rappahannock River’s streams, tributaries and wetlands could lose protection. 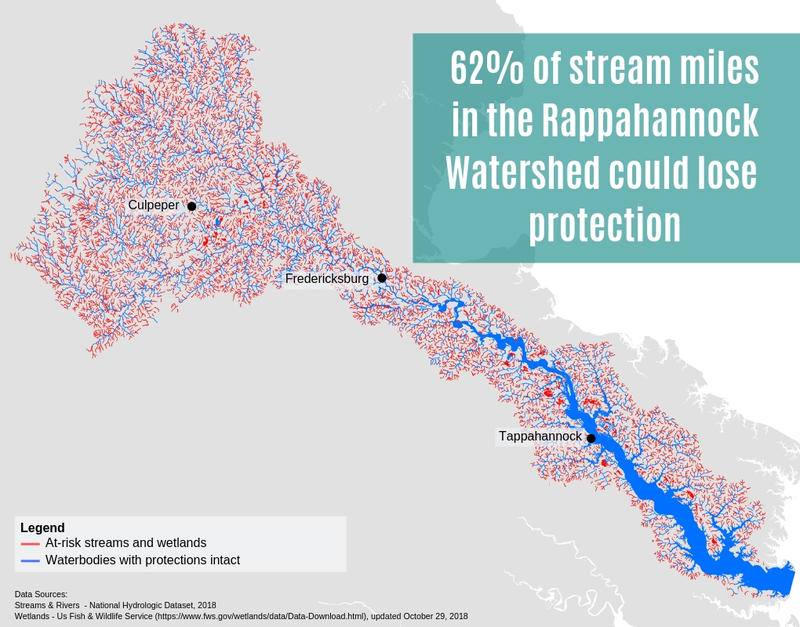 62% of streams and wetlands would be at risk within the Rappahannock River watershed. Loss of protection could lead to increased flooding and negatively impact habitat for the state fish, the native eastern brook trout. Drinking water and recreational activity are all at risk with the proposed rule. Help fight for clean water and tell the EPA not to finalize this damaging proposed rule.